The new year brings an abundance of string quartets to Palm Beach County. Last week brought the Escher String Quartet. Founded in 2005, they have become regular visitors. Their most recent appearance was Thursday at The Gold Room in the Breakers, sponsored by the Chamber Music Society of Palm Beach, where they played an all-Mozart program. 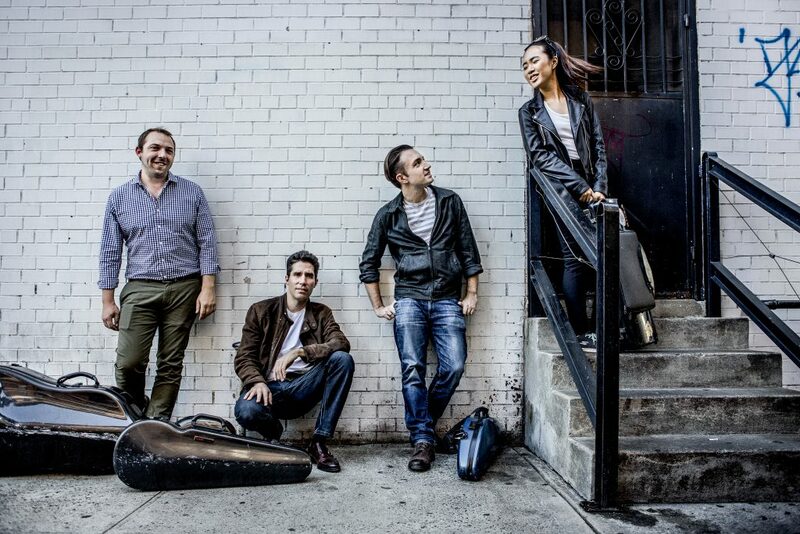 The members of the quartet — Violinists Adam Barnett-Hart and Danbi Um, violist Pierre LaPointe and cellist Brook Speltz — were joined by violist Matthew Lipman and oboist James Austin Smith. Neither Mozart nor Artaria, his publisher, named the 17th quartet “The Hunt”; however, the nickname is not inapt to the character of the opening Allegro vivace assai, with its 6/8 time signature and cheerfully diatonic melodic material. There are many formal novelties in the movement’s course that reward the careful listener. The second movement minuet and trio, highly stylized, is followed by an Adagio that featured some beautiful cello playing from Speltz, who sat inside. The foursome was always well-balanced, but I noted in the same movement that Barnett-Hart’s vibrato seemed to cloud his pitch center, lending his violin tone an unattractively seedy quality, yet that did nothing to spoil the gaiety of the concluding Allegro assai. Despite playing of quality, more refinement in the ensemble would have raised the performance from unexceptionable to something special. The Oboe Quartet (in F, K. 370) is a souvenir of Mozart’s visit to Munich in 1780, where the elector of Bavaria had commissioned the opera Idomeneo. While in Munich, Mozart became re-acquainted with the oboist Friedrich Ramm, whom he had first met in Mannheim in 1777. Ramm was a virtuoso and the quartet that Mozart composed for him in 1781 is almost concerto-like in exploiting both the soloist’s virtuosity and the technical improvements to the oboe that had taken place, to the point where the solo part includes a high F two octaves above middle C, which was the highest note that could be played on the instrument at that time. The oboe leads the way almost exclusively throughout, although the strings are more individuated in the final Rondo. It is preceded by a plaintive Adagio of a quasi-operatic character. James Austin Smith played the oboe part immaculately as did LaPointe, Speltz and Barnett-Hart. The latter had moved to the second violin chair, where I found his sound improved in that location. Violist Lipman then announced that he and Austin Smith would offer a “sorbet” before the last Mozart work: An arrangement of the song “Divná slečinka” (“A Strange Young Lady”) by Iva Bittová (b. 1958), Czech-born and now resident in the U.S., who is known for her violinism and vocalism, in which she explores experimental effects, including non-musical vocalization, and also material from folksong and world music. The instrumental emulation, plus a few grunts from the performers, was interesting to hear and pleasingly brief. I remember an essay by the late Sidney Grew, entitled “The Spiritual Drama of Mozart’s G minor Quintet,” which exactly characterizes this remarkable late work of 1787, a low point in Mozart’s life. He was unable to achieve enduring success in Vienna, and his father, Leopold, was ill. He wrote a pair of quintets with a second viola that he hoped amateurs would buy but, after borrowing against his expected income, was rebuffed by the publisher, Hoffmeister, who correctly estimated that amateurs would find them too difficult. The G minor Quintet (K. 516) is certainly the antithesis of comfortable Hausmusik. The key is strongly associated in Mozart’s oeuvre with agitation, restlessness and sighing lamentation. The opening Allegro is almost entirely in the tonic minor. The Menuetto, also in G minor, is no dance at all, with slashing, dissonant forte chords confusing strong and weak beats. The bleak mood is unrelenting despite a few tender moments. The Adagio that follows is in E-flat and played con sordino, thus imparting a delicacy to its sad lyricism, occasionally punctuated by outbursts from the second viola. G minor returns in the finale, with a tragic Adagio arioso 38 measures long, of despairing sadness (very similar to Pamina’s “Ach, ich fühl’s,” also in G minor) in the last act of his 1791 Die Zauberflöte) followed attacca by an Allegro in G major, which strongly suggests a song of thanksgiving. No wonder that amateurs shrank from attempting such a work. But the members of the Escher Quartet and guest Matthew Lipman had its measure and their brilliant account brought the program splendidly to its conclusion.